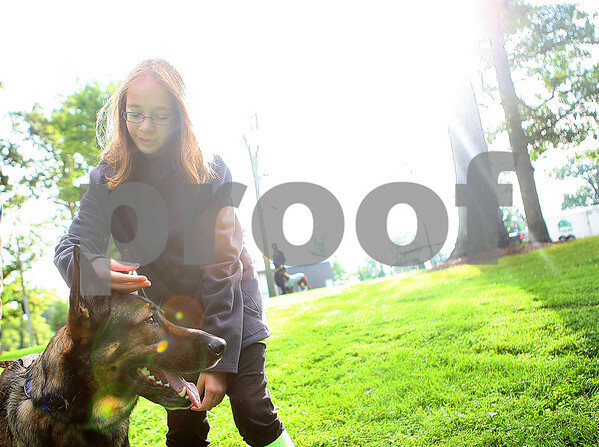 Susana Martin, 10, of Sycamore, pets Laky, a 4-year-old german shepherd from the Save-A-Vet organization at the 9th annual Tails Mutt Strut 5K at Hopkins Park in DeKalb on Saturday, Sept. 13, 2014. Martin recently donated $5,000 from a grant her and her family won from Family Fun Disney and Generation On to Save-A-Vet, a non-profit that helps rescue military & law enforcement working dogs & other service animals from being put down when their service to country & community is done, and to provide housing and relief for disabled veterans who help take care of them. Martin won the grant from launching her Halloween costume drive last year, an event she's continuing this year by collecting costumes for kids less fortunate.